Hide or highlight your hair under the Desert Dreams Slouchy – a mandala hat that’s loose and comfortable; ideal for the beach, for a resort or for a festival. The ultimate in boho-styled headwear, the is a simple, quick and fun hat to make. Your Desert Dreams Slouchy pattern is instantly available in both standard US terms and Standard UK/AU terms, with step-by-step instructions and photos to help guide your hook to completion. 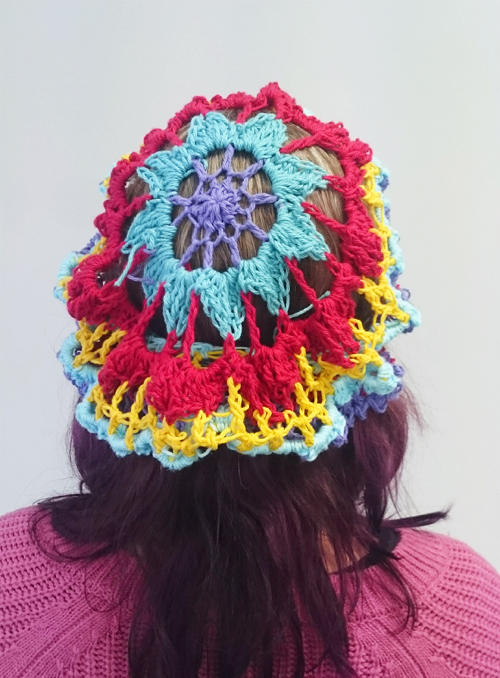 The Full of Fans Mandala can be used in many different projects and there is a matching Desert Dreams Poncho as well. In addition, the Full of Fans Mandala, which this pattern is based on, is also available. As a special deal, purchase both the Desert Dreams Slouchy, along with the Desert Dreams Poncho pattern (which includes the mandala pattern for free) and receive an INSTANT 20% discount on the set!